Hostel Bambu, Foz do Iguacu, Brazylia : Rezerwuj teraz! Our staff are traveller experinced, be able to get information and book bus tickets for you - from machu pichu trails to how to get to the falls we will help you to enjoy and get the best and easiest way. Get everything you expect from the best Hostel in Iguassu! Reliable and helpful staff always willing to help you with anything. Hostel Bambu has several partners in Iguassu, such as bars, pubs and restaurants and our guests pay less for the attractions in the city. Choose one of our packages on the Bambu Hostels website (www.bambuhostels.com) and save a lot of money on attractions in Iguassu, including Brazilian and Argentinean Falls, Rafting, Itaipu Dam, Bird Park and others. We are located at a convenient spot downtown, only 25 minutes from the Iguassu Falls, walk distance from the main avenue which has the best pubs, restaurants and nightlife of Iguassu. You can enjoy and have great experiencies. 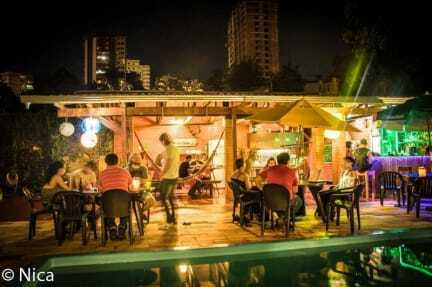 Elected as the Nº 1 hostel in Brazil by Hostelworld customers, more than a thousand reviews speak for itself. Here you are going to feel at home, it´s a great place! Clean, safe and with the all the facilities you need and wish. 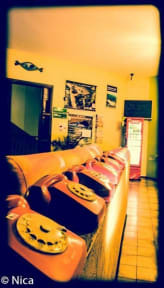 The hostel´s staff is friendly, reliable, helpful and speak Portuguese, English, Spanish and French. It's a place with great atmosphere, where you will always get in contact with people from around the world. Get all the information you need about Iguassu,Brazil and South America when you stay with us. Remember: Book your bed through the Hostelworld Website to get these Promotional Prices!